Death on the Diamond [Edward Sedgwick, 1934] is unique among baseball movies. It isn’t about a rookie’s struggles fitting in. It isn’t about underdogs struggling to win the pennant. It isn’t about the struggles of a veteran losing his skills. It isn’t about the relationship between different generations of men. Is it about baseball? Every bit of it takes place at baseball facilities. But this is 100% a murder mystery, and the baseball workplace is the setting. Part of a gimmicky series of whodunits by Cortland Fitzsimmons [tremble with fear as your mind’s eye envisions the inanity of The Girl in the Cage, co-written with a consulting magician, and Crimson Ice: A Hockey Mystery! ], the original book probably handicapped the filmmakers quite a bit. The movie’s plot is significantly LESS complex and preposterous than the original story, which involved more than one woman, more than one team, and a protagonist who’s different in every way except for being named “Larry”. Even so, it’s hard to successfully adapt a book whose only positive quality is its breakneck pace and unputdownability. The preposterosity of the whodunit genre is highlighted when you see it taking place in a non-classical setting like this. Maybe at an isolated country house in Shropshire people would keep going about their business as one of them gets murdered every three days. Maybe that would happen at a small-town theater company or at an idyllic fishing town in the Thumb of Michigan. But I refuse to believe a baseball game would resume ten minutes after a baserunner was killed by a sniper. And after the second or third attempted murder, if the team just continued with its schedule, the local paper’s headline would be “CARDINALS DEFY KILLERS!” as it is in Death on the Diamond, but there would be plenty of subheads* asking what the hell they are thinking, or maybe asking who the killers are, instead of treating a spate of murders like a spate of injuries. * The next words below that headline are “LIVER’S HEALTH DETERMINED BY GLYCINE TEST” and “POLICE TO ENFORCE CLOSING LAW FOR BEER PARLORS“. Not quite as big, but big news. After every horrifying incident, the players grit their teeth and say they’re not going to give in to terrorism. Manager Pop Clark gives an impassioned speech at one point about how the American people simply cannot be asked to do without baseball, and he doesn’t want to think about the effect it would have on the average joe if the Cardinals postponed a few games. The plot of this movie literally is the following. Baseball team is bad investment that loses money, crime lord wants to take over team, first he tries to get team’s new ace Larry Kelly to throw a game, and then he starts ordering hits on their players. Basically everyone knows he is doing this because he’s the only mob figure in the movie and the only other potential owner, so the mystery is more about who he’s hiring to do the killings. The movie’s universe also has exactly one reporter, one umpire, and one woman. For more details, I’ll turn to synopses from a beloved figure at Baseball Think Factory who has recommended this movie regularly and vociferously. A sniper kills a St. Looie Cardinal as he rounds third base in Sportsman’s Park (it was filmed on location)—and the game goes on! A pitcher is called into the clubhouse just as the first batter of the game is stepping up to the plate. He doesn’t come out, and they find his dead body stuffed in a locker—and the game goes on! And a lovable catcher is poisoned by a hot dog—and the game goes on! And the Cardinals win the pennant! The Cardinals win the pennant! Now how in the f*ck can anyone not love a movie like that? Death on the Diamond blows every other cheesy Hollywood baseball flick out of the water. Forget your stupidly sentimental Field of Dreams and your ####### literary stretches. This is the Reefer Madness of baseball movies, with three murders, an aborted scheme by the mob to take over the St. Louis Cardinals (filmed in part in Sportsman’s Park), and with perhaps the greatest character actor of all time in one of the leading roles. Of course I can only be referring to the mighty Nat Pendleton, recognizable from The Thin Man and an infinite number of other movies. Nat Pendleton alone makes any film worth watching. And he doesn’t even mention the non-fatal plots, including Medea/Creusa-style poisoned gloves, and mobsters shooting out the tires leading to Larry’s minor wrist injury and estrangement from the team (Pop: “Costs money to carry disabled men on this trip”). "When it comes to the hot dogs, I'm an epigram!" 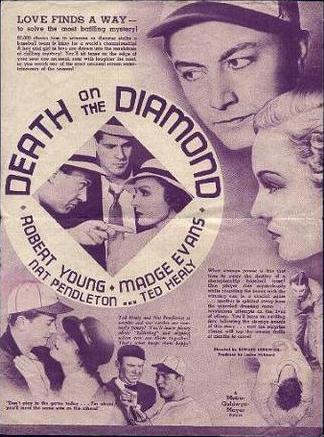 Being in the whodunit genre, Death on the Diamond doesn’t move along at a rapid clip, since the audience needs to be confident that every potential piece of evidence was clearly presented. There’s multiple opportunities for dramatic actors to really ham it up [see the end of this post for examples]. 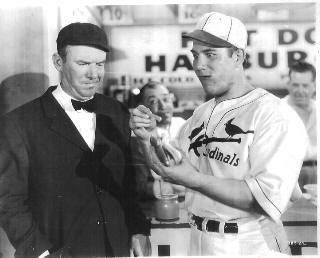 For comic relief, the aforementioned Pendleton plays a really dumb guy who feuds obsessively with the umpire who apparently travels with the team, played by legendary Three Stooges impresario Ted Healy (see picture at right). When Larry Kelly shows up to lead the team he has some “first they hate each other, then they love each other” snappy banter with the woman, Pop Clark’s daughter and the team secretary. This snappy banter is utterly cringeworthy, the “then they love each other” part of the equation is more like “then she loses enough brain cells that her revulsion turns to indulgent fondness”, in the effervescent romantic tradition of Mr. Deeds and Me, Myself and Irene, and I really didn’t like the guy. He’s played by Robert Young, future titular protagonist of Father Knows Best and Marcus Welby, M.D. All I know about either of those shows is that the Robert Young character was kind, trustworthy and beloved by all, so he shows some range as the cocky airhead Larry Kelly. Is it a period piece? Oh, no. Ripped from the headlines. At least the teams’ uniforms are. According to the Hall of Fame, 1934 was the ONLY year that the Reds had an odd little touch on their tops — the word “REDS” written at the end of the sleeve parallel to the cuff. If you want to see every detail of the Cardinals’ flannel bird-on-bat jerseys and red-white-and-blue striped stirrups from the Gashouse Gang era, this movie is for you. Also if you want to see the Reds wearing weird hats with “CR” on them, which the Hall of Fame denies ever happened. Cameos from big-leaguers? Several Cardinals are extras and stand-ins, including Ernie Orsatti [father of legendary TV stunt coordinator Ernie Orsatti] as the baserunner who gets shot. But the spotlight is on a big-league stadium, not a player. In an unusual move for the time, especially for a cheapo genre movie like this one, some of it was shot at the Cardinals’ home field, Sportsman’s Park. You can see the St. Louis Globe-Democrat ad on the centerfield wall. In fact, during the first Reds-Cardinals game, you can see the brick building advertising Lackner signs behind left-center, indicating that it’s Cincinnati’s Crosley Field…although that may be from stock footage. Shooting was divided between Sportsman’s Park and, of course, L.A.’s Wrigley Field. I wonder which one had the “THEY CAN’T BEAT US” sign above a doorway in the locker room — that’s a nice little detail. What are ballplayers like? There’s a couple really dumb guys who say goofy stuff. Otherwise, they’re smug bastards who have fake smiles all the time and try to one-up each other in front of girls. Larry Kelly is particularly smug, and the reporter played by Paul Kelly is even worse. Even the brim of his reporter hat looks like a smirk. This creates tension and brings more heat to the obligatory “Someone in this room is a murderer. We’re all suspects.” scenes than you would get from a jovial bunch of buddies. Can the star play baseball? No. On some of his pitches the film is clearly sped up at the moment when he releases the ball. For a 27-year-old in 1934 this is not impressive. Ex-Olympic wrestler Nat Pendleton looks like a ballplayer, though. The Hack Wilson type. What are managers like? Pop Clark is sort of a Jimmy Stewart type, with a hangdog look and a paternal, ever-patient demeanor. He looks like Jesse Haines, whose nickname was “Pop” at this stage of his career, and who was in his 15th of 18 seasons with the Cardinals in 1934. Actually the team owner, Pop is running out of money and had to fire the coach and take over himself. The players admire and adore him. They were really bad last year, they got worse except for adding Larry Kelly, their stars keep getting murdered, but they’re intent on winning the pennant so Pop stays afloat and doesn’t need to sell the team to someone with money. 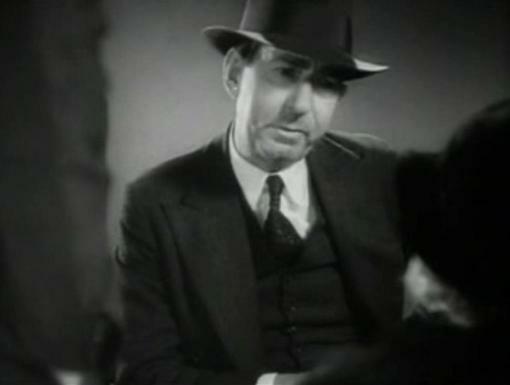 David Landau, seen here in Union Depot (1932). As Pop Clark he looks just like this but with a baseball cap. One of the most dignified and humorless managers I’ve seen in a baseball movie, Pop is played by the tall, sonorous stage actor David Landau, who was the villain in Horse Feathers, Wallace Beery’s frustrated rival in She Done Him Wrong, and the warden in I Am A Fugitive From A Chain Gang. Unlike a lot of the actors, both he and Madge Evans as his daughter look like they’d rather be in a less ridiculous movie. Is William Frawley involved? No. 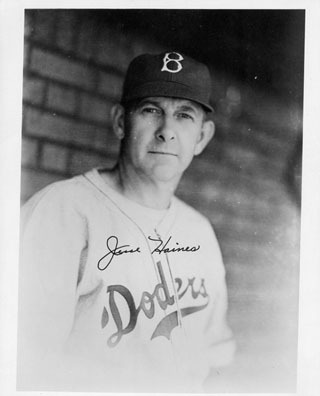 He was probably insulted by the lack of verisimilude, and by the suggestion that L.A.’s Wrigley Field wasn’t sufficient to film every baseball movie imaginable. Climactic game? Of course. And this time…not just pride is at stake. Will it wow me, the modern viewer, with its documentation of a bygone age, and if so, how? Getting a look into Sportsman’s Park and Crosley Field, and that’s about all. The players spend some time doing fielding drills, and they casually do bare-handed grabs that everyone would use a glove for nowadays. You’ll enjoy the scene-stealing attempts of Nat Pendleton, DeWitt Jennings, and as the unhinged umpire, Ted Healy, who was best known for things other than acting. Click here to read the monologue he declaims after the poisoned mustard attack. Click here [SPOILER ALERT] to read the monologue by which the murderer confesses, when he regains consciousness after being spotted skulking around in the dugout by Larry Kelly, who then knocked him out with a fastball thrown from the mound. And here’s some amazing repartee between Pendleton and Healy early in the film. 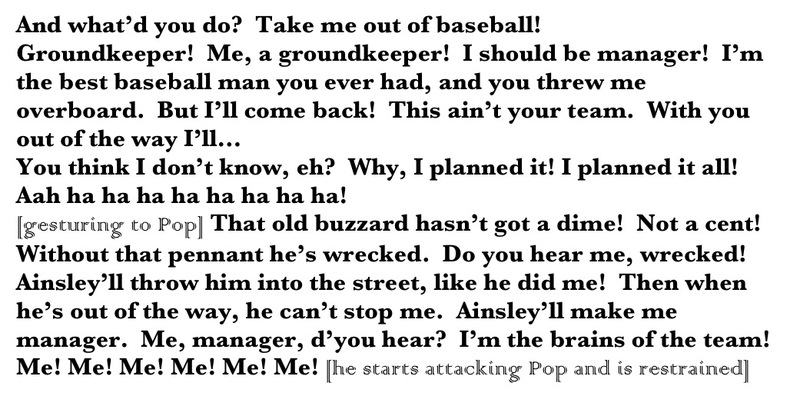 – [To a batboy] Now you run along and don’t bother us ballplayers. – Ballplayer! [chuckling] Get him! – Don’t tell me they’re lettin’ you empire again this year! – Whad’ya mean, lettin’ me? They begged me to empire. – About time this league got some empires what’s got eyesight. – What’s the matter with my eyesight? – Nuttin’. Only you can’t see. – A man’s gotta settle down on first base and raise a family before you call him safe. – How do you know? When did you ever get to first base? – What?…Everytime you wasn’t empiring, that’s when. Every time. – Hey, listen. Let me tell you something, Crawfish. – Now wait a minute. Get this straight! My name is not Crawfish, you hear me? My name is Terry O’Toole! – Yeah, and mine’s Santa Claus. Listen, your name’s Crawfish. K. R. A. W. F. I. Ish. Crawfish. And no credit to the Crawfish family. – Keep it up, keep it up. I guarantee I’ll fine you fifty dollars. – That’s all I want you to do, hit me. Do me a favor, will ya! Do me a favor! Hit me! That’s all I want you to do! Rating? 3 Jesse Haineses out of 5.